These days I’m generally a console gamer (Xbox 360, PlayStation 3) but sometimes I’ll play games on my what would these days be considered dinosaur PC (Intel Core Duo CPU @ 2.13Ghz , nVidia Geforce 8600 graphics card and 2Gb of ram) by today’s standards. 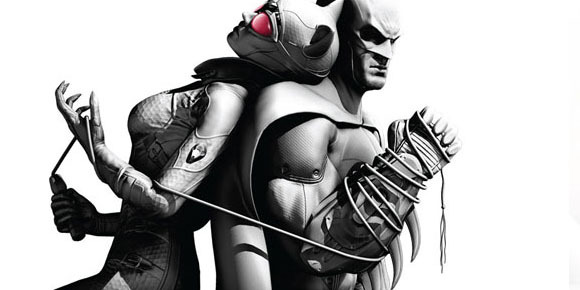 I’m playing a PC game at the moment: Batman Arkham City. I loved it on Xbox 360 so jumped at the chance when I was offered a review code to download it from Steam. Almost 24 hours later the 16Gb download was complete (yes, my broadband really did take that long) and I clicked play, eager to see how it played on PC – and was prompt for the game’s CD key, which meant I had exit the game to head back into Steam and copy the CD key) . I also had to log-into Games for Windows Live, which also required a copy of the CD key, as well as aan update, which it downloaded and installed – and then just when I thought I was ready to play, I had to request a new password for my GFWL account as it had been so long since I’ve used it that I had forgotten my password and couldn’t log in. With all that behind me I launched the game, tweaked some of the settings (I’m running it in DirectX 9 as the Geforce 8600, which is below the recommended specifications for the game, doesn’t support DirectX 11, which is what Batman Arkham City is touting). then got stuck in. Not surprisingly, the game stutters from time to time, most noticeably when there’s a lot of foes on-screen but sometimes pauses for a few seconds, usually as I’m just about to glide kick one of Joker’s hench men into next week. It goes without saying that I’m also not using the Physix capabilities that the game has – that would slow things down to a slideshow, (in fact, I might just try it, for a joke, and see what the frame rate plummets to). The game still looks great, though – this is on a PC, after all – but all the hassles with Games for Windows Live and recommended systems specifications needed to get the game looking its best is partly the reason why I play my games on a console. I can hear all the PC purists starting to complain about my preference for console gaming but seriously, I can slap an Xbox game into my 360 console – or a friends 360 console – and know that it’s going to work straight out of the box (unless there’s an update required for it, of course – but then they don’t normally take long to download and install). My Xbox isn’t going to ask me to type in a CD key twice then promptly crash back to the desktop/menu because I had my tongue in the wrong position or something. But these days, I prefer console gaming because of the convenience – and that I don’t have to constantly spend money upgrading the hardware. Yes there’s a trade off with consoles: less system memory and pared down graphics performance compared to a PC but imagine the nightmare PC games must be for developers to make: how is a developer realistically expected to anticipate all the potential hardware configurations in existence then make sure that the game works on all of them. It just seems a near impossible task. Same boat as you Gerard, and the constant need to fiddle around with/upgrade PCs is part of the reason I switched from PC to Mac earlier this year. Consoles just make it easier (plus I can play PC games on my Mac if I can be arsed buying a copy of Windows and setting up a Windows partition) – you know things will work, and you don’t need a persistent internet connection (some of the current PC DRM is horrible). The Mac works great as a home entertainment center and PC, the Xbox 360 is the gaming machine. I do have a fairly recent pc, but the graphics card lets me down.. I get the odd sale from Steam, but its just so satisfying to put the disc in the xbox and play. Hey Gerard, im pretty sure with Steam you can press Shift-tab to access the steam menu for the cd-key. -wouldnt be the first time im wrong tho otherwise. Work has blocked all the gaming sites apart from this one and stuff, so glad you’re around.. you’re keeping me sane. Yeah, I eventually worked out that Shift tab does access the menu in Steam, Glad I’m helping you keep sane. I’ll be sticking around as long as I can! I used to be a PC gamer 15 years ago. I just remember the frustration of seeing all these amazing games in EB and then realizing cant play any of them. Ill always have a soft spot for flight sim and sim city. PC is defo the only way to enjoy those games. I know a PS4 will come out eventually and ill have to buy it. But ive got 5 years out of my PS3 and will get another 3 years out of it, the quality of game continues to improve dramatically. Cant wait to see what the likes of Mass Effect 3 will be like. GWFL is generally a turd. Having to log into that and steam is just annoying and it seems to waste time. To m0rph3us, it sounds like your choice of PC hardware was letting you down and now you are just happier with a mac, but like all systems, unless you plan it well, it will have tradeoffs or bottlenecks somewhere. The biggest for a mac is that its an appliance, and you pretty much have no ability to upgrade it. If you spend a bit of time looking at PC technology and what is coming up, vs what is on its way out, you can do well, and get a machine that isn’t groaning 6 months after you buy it. By the way, I do have an Xbox, but only for Rockband. I think the comments about having to constantly upgrade your PC are a bit misinformed (Not a reflection on you though Gerard, since your PC really is a bit out of date), but generally now the consoles are the benchmark in terms of hardware updates. If your PC could play a game well when the PS3 was released, then chances are it can still play a game well now. That will all change again of course once the PS4/XBOX 720 is released and the hardware expectations of games goes up by another notch. There are a few exceptions though – Games like Witcher 2 & Battlefield 3 can really test a machine, with settings that far exceed what consoles are capable of, but these can be scaled down for console like settings. I agree though with the other sentiment – I have moved away from the PC, even though it runs rings around my PS3. The PS3 is just easier – You put a game in, and it just works. Not only that, you’ve got one universal account (PSN ID), and you’ve got a universal set of trophies/achievements. There’s no messing around with GFWL, no playing around with settings to get optimal performance, and no endlessly banging my head against the wall when some automatic update breaks something. Not only that, but gaming wirelessly on a couch (or usually lying on the floor) in front of a 60 inch TV offers a level of comfort that the PC could never compete with. I very rarely use my PC these days, because my PS3 is now my platform of choice.